Herewith are the postal zip codes for the cities and municipalities of the Province of Batangas re-posted for the convenience of visitors to Life So Mundane. 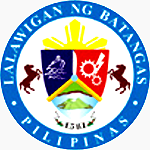 The zip codes are extracted from the official web site of the Philippine Postal Corporation. The list is presented in alphabetical order. Kindly note that while Fernando Air Base is in Lipa City, the Philippine Air Force facility has a zip code of its own presented at the bottom of the table.